It always makes me happy when there is a Cardinals game on Mother's Day. 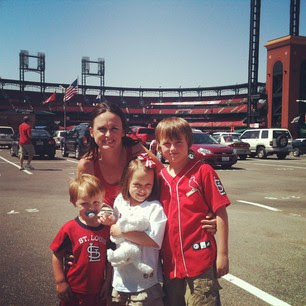 Kanin's very first Cardinals game was on Mother's Day 2005. Here we are all these years later still carrying on the tradition of going to the ballpark for Mother's Day. This year we met some of our friends before the game and had lunch. Of course, one of our favorite things to do at the Cardinals game is get our picture taken with Fredbird. I love Fredbird! This picture was taken in the 4th inning. We were trying to hurry up and just get a quick picture snapped and didn't realize that Kanin was squinting so much. Oh well, such is life with three kids. After the game, we went to my mom's house. She had chili and stew waiting on us and my sister and her kids were there, as well. I am so bummed that I didn't take a picture with my mom. I told Scott when we pulled up that I wanted to get one. I hope you guys had a great Mother's Day! Looks like a fun day!! You got lots of great pictures with your babies!!! Glad you had a great Mother's day. You deserve it!!! Btw, I love the picture in your header!! Adorable!! Kanin's hair is so cute!! I'm glad you had a great Mother's Day. I went to the game last night-- forgot how much fun they are with just girlfriends! such cute family pic at the end! love that you guys are such a baseball-loving family! precious memories that'll last a lifetime and you're raising some super Cardinal fans, that's for sure! such fun! Happy belated Mother's Day I'm so jealous of you being able to go to all the Cardinal games. I'm a huge sports fan and living in a small city like this I only have one pro sports team. I'm a huge Cardinals fan so when I read all your posts I get sad that I'm not in those seats! Looks like you had a great time.